Several times this spring and summer I’ve been tagged in an invite to join a group of folks for a ‘Moonlight Paddle’. The paddle begins a little before sunset at Beav-O-Rama. The group paddles about an hour up the White River, banks on the shore, then takes a short walk to Saddlebock Brewery. After the moon rises, the group paddles back. 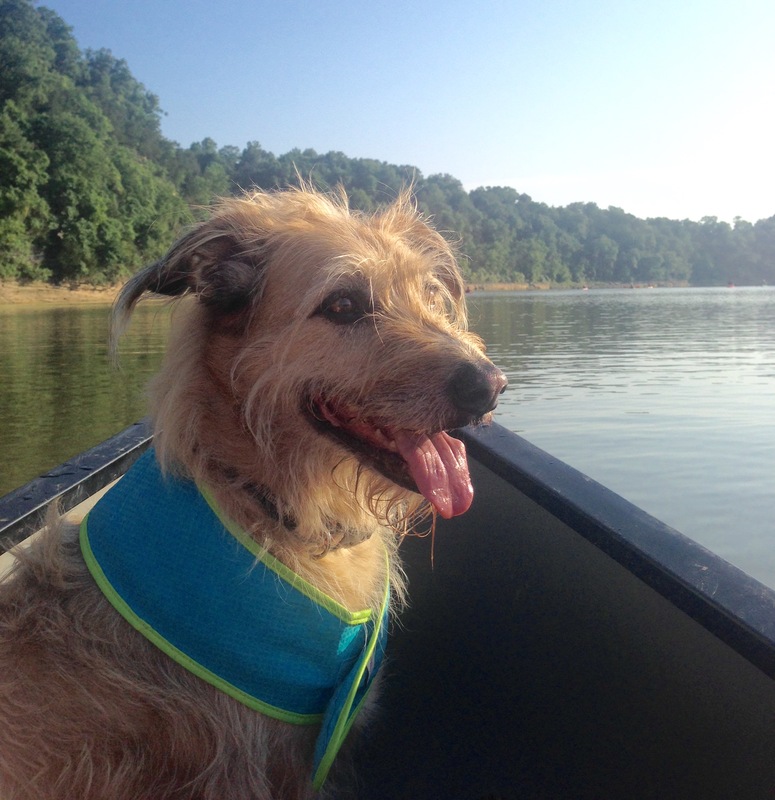 This past Saturday night I was in town without plans, and my friend Amanda, along with her dog, Violet, agreed to share their canoe with me and Henri. Amanda is a seasoned paddler and feels about the river the way I feel about the lake. Always ready. We’ve know each other a while but we’ve never paddled together. So I wasn’t really sure how it’d work out for us. I’m a novice, and according to most of my more advanced friends, paddling together can make or break a relationship. My strategy with Amanda was to follow her lead and do what I was told. The only problem we had on the way to the brewery was Violet- who’s used to paddling solo with her Mom- wondering why I was in her seat. This is a smooth, easy paddle for a novice- if you’re in the right kind of boat. As I indicated in my text to Mom the water isn’t especially lovely, but the surrounding scenery is. High weather-worn bluffs with cascading greenery, the occasional Heron or splash of a fish, birds singing, and green pastures with grazing cows languishing in the cool the water. Once at the brewery, where leashes are kinda optional, we enjoyed relaxing on the deck. We played some baggo, sang some songs, ate and drank. As we readied ourselves for the return paddle, it became apparent that one member of our group was in no condition to manage her boat. She had come in a kayak, a not-designed-for-still-water-very-unstable kayak. The safest option was for me to take her boat and her to ride with Amanda. As I’ve already said, I am a novice. The sum of my paddling experience is exactly two float trips, one paddle boarding excursion, and less than a dozen ocean kayaks. It seemed the wise decision was to leave all of my stuff in Amanda’s boat and just take Henri. There was a small ice chest behind the seat of the kayak, but I couldn’t reach it without affecting our stability. 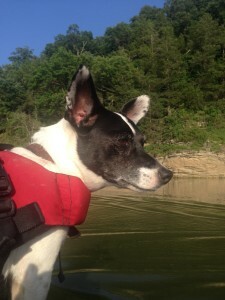 With straps on my shades and a life vest on my dog, we traded vessels. Unsteady doesn’t begin to describe how I felt in this boat! My strength is in my legs, not my core, not to mention that I’m easily distracted and not a fast/strong paddler. Fortunately, it was a patient group. I was paused in a cove-like area talking or looking at something, and suddenly, we weren’t in the boat anymore. All I could think as we went over was ‘clear Henri’. Somehow, I also managed to grab the ice chest. For a few brief minutes, I wasn’t quite sure where Henri was. I knew he was safe because I’d pushed him away from me and the boat, and he had his vest. He apparently swam to the nearest sympathetic paddler he could find and when the poor guy tried to help Henri onto his kayak, he dumped too. Sorry, dude. Thanks for trying to save my dog. I owe you a beer. Once I realized Henri was in a bit of a panic, I had someone else hold my boat so I could get my dog. I called him and he swam to me, then together we swam to the shore. To the same shore where the cows had been “languishing in the cool water”. Do you know what else cows do in the water?! Yup. That. Thankfully, I didn’t have time to think about that as the incident ensued, but I had a LOT of time to think about it as we paddled back to our cars. I also had a lot of time to think about it as I drove home, windows down, Henri and I drying to a foul, muddy crust in the humidity of an Arkansas July midnight. Once home, I pretty much stripped on my front porch (Sorry, Mom. I don’t think anyone was looking.) and left everything outside. I carried Henri to the bathroom where we both got in the shower. For once, Henri didn’t seem to mind. While you’re still laughing and I have your attention, I want to take a brief minute to talk about protection and conservation of our natural resources. There’s a reason the water on that portion of the White isn’t so great, and that reason could be runoff from pasture land. In these parts, it’s a big issue. Excess nutrients found in fertilizers and manure contribute greatly to the depletion of oxygen in our water systems. Without oxygen, the ecosystem can’t survive. In 2012 a huge stink (pun totally intended) was raised when an industrial scale hog facility was built on the banks of Big Creek, just 5 miles upstream from the Buffalo National River. The Buffalo is our nation’s first designated ‘national river’ and we need everyone’s help to protect it. Please visit the Buffalo River Watershed Alliance for more information or get involved protecting the watersheds in your own community.